I haven't been much for blogging this week. It's not due to a busy schedule, just a bit of blogger's block. It may not seem like it due to only two days' time elapsing between this post and the last, but it sure seems like it to me. My thoughts are all over the place this week, especially heading into this weekend. My thoughts are in anticipation of Sunday worship, with the second part of my mini-series on David and Bathsheba forthcoming. 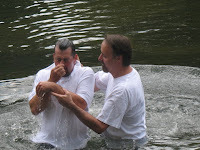 We'll also celebrate an adult baptism, which of course is less common in my tradition. Nevertheless, it will be a joyful moment in this young man's life and I'll be glad to be a part of it. My thoughts will be in Jamestown, New York on Saturday, when the ashes of my grandparents are finally laid to rest together. I'm unable to go, but it will be a special sacred moment that for some will provide full closure. For me personally, my grandfather's funeral in March provided that closure because there was an air about the service that we really were celebrating my grandparents as a couple and not just my grandfather. My thoughts on Sunday morning will also be with a pastoral colleague in Michigan as his church worships for the last time before closing its doors. I can't really fathom the emotion that will surround this moment, but I'm certain that it will be powerful. My thoughts the next two days will be with the Ohio Conference as it comes together for its annual gathering in Columbus. I've purposely elected not to go, mostly as a continuation of devoting time to family after so many earlier summer weekends spent performing weddings and attending Synod. On a lighter note, my thoughts are in Ann Arbor as a new college football season nears. Almost by default, the Wolverines are expected to do better this year. Still, the anxiety is palpable and I've been clinging to whatever daily updates MGoBlog can provide. They'll again field a young team, but they'll at least be more RichRod's guys and less Carr's leftovers. These are a few of the things I've been thinking about the past few days, and will think about at least through the weekend. I could have blogged about any of them, and perhaps still will at some point. But for now, I'm content with more of a quick rundown.